Ask a preschooler what you should name your unborn baby and you are bound to be left with some pretty incredible answers. This is exactly what preschool teacher Miss Julie did and the results are, well, exactly what you would expect from a classroom of three-year-olds. Tell us, which “name” gets your vote. Miss Julie’s cousin posted the photo of the results on Reddit last week and it was an instant hit. Kids say the darnedest things. And they come up with even better names. Let’s just say that her students give some of the wacky celebrity baby names a run for their money. 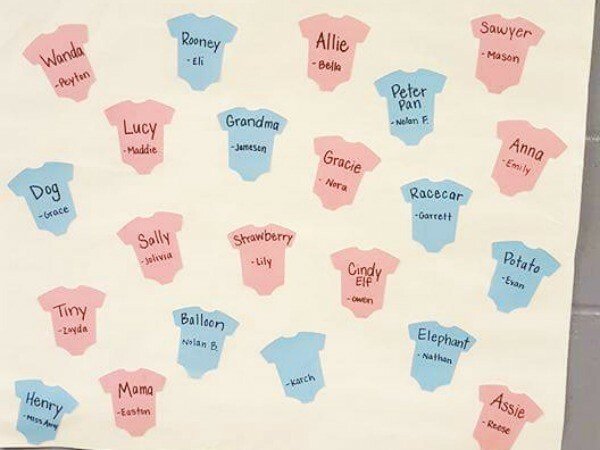 While some of the kids chose relatively normal names like Sawyer and Gracie, most are a little bit out there, clearly inspired by favourite characters and toys. And also vegetables. We’ve got one vote for ‘Racecar’. We’ve got another vote for ‘Potato’. We’ve got an excellent suggestion of ‘Dog’. And then there’s ‘Cindy Elf’. So who gets your vote as the best name? ‘Elephant’? ‘Balloon’? ‘Peter Pan’. Or perhaps Karch’s suggestion of “blank” wins.